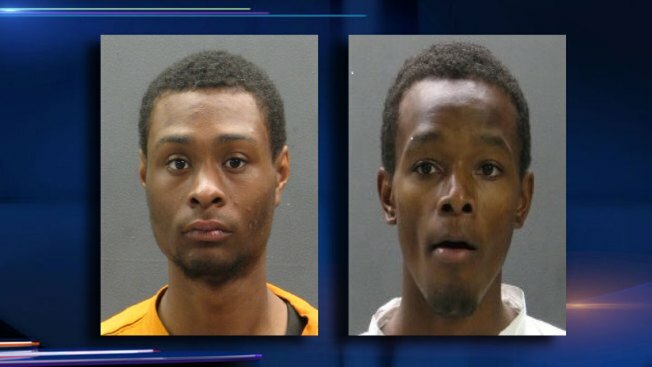 Two men facing murder charges in connection with the shooting death of an off-duty Cook County Sheriff's investigator were ordered held without bond during a Monday morning court appearance. Gage Thornton and Brandon Jackson, both 22 years old and both of the 200 block of 30th Avenue, were charged with first-degree murder and attempted armed robbery. Prosecutors said the pair had been in custody since 3 a.m. Saturday, just hours after Cook County Sheriff's Police officer Cuauhtemoc Estrada was slain during a robbery attempt. Estrada's family was not in court Monday, but several of the defendants' family members were. Prosecutors in court said a surveillance camera from the VFW hall where Estrada was shot recorded the incident. Family members said the off-duty officer confronted two masked men with a large gun who were robbing his daughter's boyfriend outside of a holiday party. Police said Jackson shot Estrada in the chest when he reached for his weapon. It was not clear whether Estrada was carrying a service weapon or a personal one. Authorities said footprints in the snow lead them to Thornton and Jackson's home, which is just about 400 feet away from the VFW hall. Both men were inside, as were the red hoodie and ski mask Jackson wore to partially cover his face during the shooting, police said. They also found a distinctive red jacket with blue sleeves they said Thornton was wearing during the shooting. The .44 caliber revolver used in the shooting was not recovered, police said. Both men have previous criminal records, but nothing that rises to the level of murder, said Andre Harvey, Bellwood's Director of Public Safety. Thornton's uncle said his nephew has the mental capacity of a fourth grade student. Cook County Sheriff Tom Dart said Estrada was a former U.S. Marine and a 20-year veteran of the department. He worked in the department's electronic monitoring unit, according to sheriff's spokesman Ben Breit. "It's horribly sad for everybody," Dart said. "He was an amazing person."